Alone in his cold Arctic igloo, Polar Bear feels sad. How can he cheer himself up? He sits down to write a letter to his friend Koala, who lives in a sunny forest full of trees and flowers. 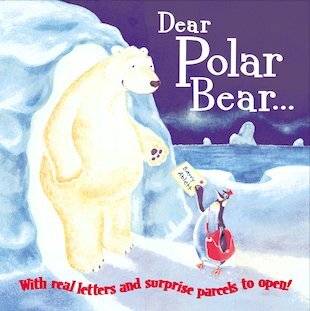 Next, he writes to Sun Bear in Malaysia, and Panda in China, and all his other bear friends around the world. When they write back, he can hardly believe the surprises he receives in return! And one day, Polar Bear receives the best surprise of all. Can you guess what it might be? A brilliant novelty book full of real letters and parcels to open, with a pop-up treat at the end!